Becky McFadden, moved from Odessa, TX to Kerrville in 1986 with her husband Bruce (Sul Ross State University) and their two sons who were ages four and two at the time. Kerrville has been a wonderful place to raise a family, make friends, work, and enjoy life in the beautiful Texas Hill Country. Becky grew up in Pleasanton, Texas and after 8th grade moved to Portland, Texas where she graduated from Gregory-Portland High School. She attended Southwest Texas State University in San Marcos, worked for the University of Texas Medical and Dental Application Center in Austin, married in 1974 and has lived in Alpine, Beaumont, Waco and Odessa. 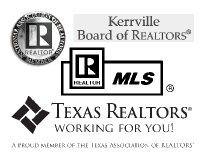 Two years after moving to Kerrville, Becky started working in real estate for Schreiner Bancshares Main Properties. Her sons both graduated from Tivy High School and from Texas Tech University. Becky cherishes her wonderful Father who worked for Exxon for 40 years. He lives in Kerrville. Becky's parents were married 71 years before her Mother passed away. Her siblings include an older brother (Texas A&M) & older sister (Tarleton), as well as one younger brother (Texas A&M) who all live in Texas. Becky feels blessed to have a wonderful family whom she loves dearly. Becky equally feels blessed to have an expansive family of friends whom she's met and cultivated rewarding relationships with over her lifetime. Selling real estate has been the perfect avenue to meet and help so many terrific people.